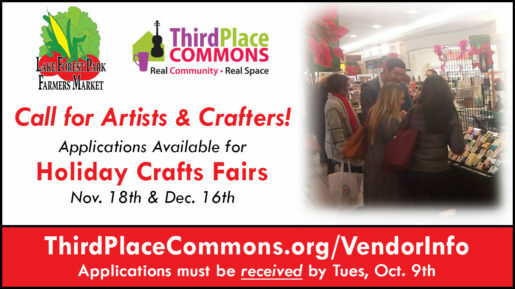 Applications are now being accepted for Third Place Commons’ Holiday Crafts Fairs on Sunday, November 18 and Sunday, December 16. Applications for these juried events must be received by Tuesday, October 9th for guaranteed consideration. All items must be handmade in Washington by the individuals selling at the market. Artists and crafters of all media are encouraged to apply to represent a broad spectrum of creative endeavors. Get more information and download the application here. The Lake Forest Park Farmers Market and Holiday Crafts Fairs are presented by Third Place Commons, a community-supported, 501(c)(3) nonprofit organization dedicated to creating real community in real space. Learn more at here. Next Post: Ring in a New Era with a New Market Bell on 9/23 - Special Ceremony!